New in Translucent 2 is a completely rewritten, redesigned and re-conceptualized application. No longer does Translucent keep it self innocuously in the status bar with a small icons but has now moved to being a active participant in the Finder. It now displays its icon in the Dock and provides all of the same information in more meaningful and easily accessible ways. Translucent Lite has all the same interface elements of its big brother but has a reduced set of features. It provides a great way to see if Translucent is right for you without any commitment as it is free on The Mac App Store. . Translucent Lite is completely functional version of Translucent that never expires but only includes the CPU and memory information, you'll have to get the full version if you want network, disk, system sensors and statistics. Here is the Full List of differences. 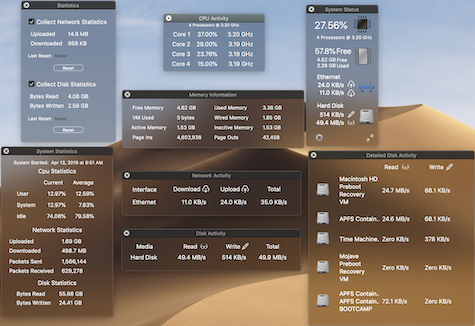 Translucent displays a wealth of information about what is happening inside of your Mac at any given time. One of the most important parts about having all of this information is having easy, unobtrusive access and then dismissing it away when no longer needed. Though Translucent 2 carries many of the original displays of its predecessor, they have all been rewritten to provide even more information than before. Before the information Translucent displayed about your computer was located in the system menu bar. 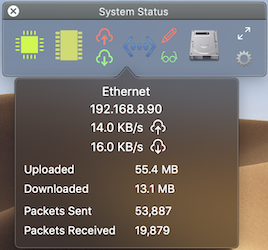 Now Translucent provides a new window to display the same information in a much more meaningful way that shows much more precisely what is happening inside your Mac. All this detailed information comes at a price, namely screen space. So to help counter this the new Status Window has a larger presentation with a wealth of information or a reduced version to save on space, all the time having a double-click away from all of the underlying information. Taking the place of the icons in the status bar in the previous version of Translucent is the new System Status window. 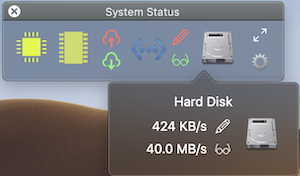 The System Status window incorporates all of the information that was available in the status bar icons but presents the information in a more readable, recognizable and easily discernible way. With a totally redesigned and re-conceptualized interface it's now easier to see all the aspects of the current state of the Mac. The System Status window has two different presentation styles of sensors that either give full sensor information at the cost of screen real-estate or in a compact versions that present an indeterminate-style for each of the sensors. Better yet is the sensors in both System Status window styles have popovers to allow for quick access to almost all the information that would otherwise require accessing other sensor windows. The System Status window strives to have all the information in Translucent to never be more than a few clicks away. Each one of the processors running on the Mac can be sitting there idly by or be crunching through instructions at the maximum throughput possible, but how would anyone know? Translucent keeps tabs on each one of the processor in the system as to how much it is working at any given time, whether it is idly spinning by or working at its maximum potential. 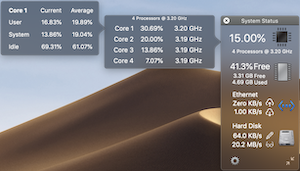 In Translucent 2 the CPU Activity window is still there but it has been augmented to allow for more information about the CPUs to be accessible. Now the detailed information about exactly how much of each processors time is being used by either the System, User or Idle process is easily accessible. Even easier is the information isn't just kept in the CPU Activity window but is easily accessible from the System Status window. Memory is a very important resource on any computer, not enough and the computer will spend all of its time thrashing pages to the virtual memory. Translucent displays a wealth of information about not only how much memory the system is actively using but also the break down of how the system is using the different aspects of memory. Want to know how much memory your computer has used? How much memory is still free on your computer? 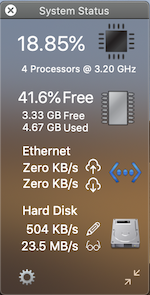 Translucent can show you exactly how memory your computer is using and how much memory is still free to be able to do other things. 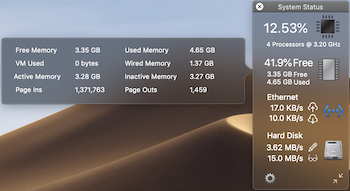 For those of you out there who still want to know more about exactly how the operating system is using memory, all you need to do is open the memory information window and you'll get the down and dirty details, such as how much memory has been wired down, page ins, page outs and more. Ever wonder if your computer is actually sending or receiving anything at all through its network interface(s)? 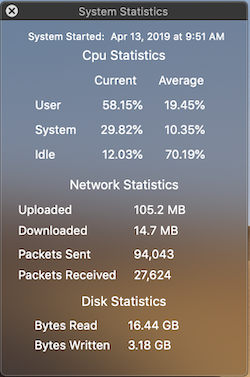 Well Translucent can show you at a glance or in detail about the amount of data that is actually going through your network ports. Translucent can show you at any time how much, or how little, data is being sent and received at any given time. Now you can diagnose if the reason that web page isn't loading might be because your using all your bandwidth downloading that large file, though Translucent still can't stop someone else from hogging all the bandwidth. Now in Translucent 2 each individual network interface can be interrogated as to not just how much it is sending and receiving at any given time but also the total amount of data that has passed through each interface since the system started. Knowing if the computer is a actually reading or writing something to the disk, or it's just idling sitting by not doing anything can provide insight into why your computer is behaving as it is. Translucent 2 has completely rewritten the interface into the disk system from the ground up. It now not only gives the global information for the disk types and break downs for each of the physical disks on the system, but now also breaks it down a step further and can display the underlying physical disk information. Now you can drill down to not only the partitions that make up a physical disk but you can also get the underlying BSD structure and size associated with the disks. For those of you who have multiple disk drives attached to your computer, you may be more interested in how much each individual drive is being utilized instead of an aggregation of a single type of drive on the system. Translucent will not only display the read and write speeds for each physical drive on the system but will also organize the partitions that each physical drive contains so you can easily see what's going on under the hood. 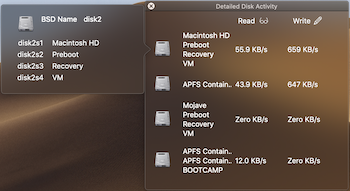 Mac OS X keeps detailed accounting of the various aspects of the computer's hardware, from the bytes read from disk to the packets that have passed through the network interfaces since the system was started. Now Translucent provides easy access to the details that the operating system has kept buried away and brings them all together for easier viewing pleasure. 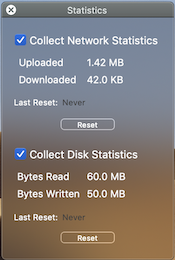 Also you may be interested in not only the amount of data read and written to the disk or the amount of data uploaded and downloaded from the network since system start but the total amount over a period of time. Translucent will allow you to keep an accounting of that information that persists across system reboots**. For the energy conscience out there Translucent 2 also strives to use the least amount of energy possible using one simple question for its design: If I don't see the information, it shouldn't be collected? Well Translucent 2 does just that, if you don't need to see the information, it doesn't bother to collect it. So, if you don't have any windows open and your not collecting statistics Translucent just goes to sleep and waits for you to open a window to get some of the information. *Translucent requires a Macintosh® Computer running Mac OS X® 10.10 or later and is available on The Mac App Store. **Translucent's record keeping of disk & network totals is for informational purposes only and does not dictate an absolute total for the system over the given time period. The original version of Translucent has not gone away, it is still available from the Mac App Store. Apple has changed the design guidelines and has put the original Translucent into a deprecated arena for a future release of Mac OS X. It will still be available for compatibility updates and those with a compatible operating system version. Mac®, Macintosh®, The Mac App Store® and Mac OS X® are registered trademarks of Apple Inc.